Discuss the makerspace, get training for equipment and print large format posters. Note: Use (part code SA156) specific bobbins! Place bobbin on bobbin winder shaft (align spring with notch on bobbin), press down until snaps into place. Slide bobbin winder to the right until it snaps into place (start/stop button lights up in orange). Place spool of thread on spool pin so the thread unwinds to the front at the bottom. cap should be larger than the head of the spool. Return spool pin to original position. Pull thread and pass under the thread guide hook. Pass behind the thread guide cover and to the front. Pull to the right and pass under the bobbin-winding thread guide hook and then counterclockwise under the pretension disc. Wind the thread clockwise around the bobbin five to six times. Pass the end of the thread through the guide slit in the bobbin winder seat and then pull the thread to the right to cut it. Slide the sewing speed controller to the right. Press start/stop again in the event the bobbin does not wind correctly, once the bobbin winding stops or when it becomes slow. Cut the thread with scissors beside the bobbin-winding thread guide, slide the bobbin winder shaft to the left and remove the bobbin from the shaft. Slide sewing speed controller back to the left. Press needle position button once or twice to raise the needle. Raise the presser foot lever. Slide the bobbin cover latch to the right. With the thread coming from the back of the spool, hold the end of the thread in your left hand, insert the bobbin into the bobbin case with your right hand. Lightly hold the bobbin with your right hand and guide the thread through the slot on the left. Pull the thread toward the front to cut. Reattach the bobbin cover by inserting the tab into the left hand corner and carefully pressing down on the right side until the cover snaps into place. Raise the needle/holder to the highest position. With the flat part of the needle facing the back of the machine, insert the needle into the needle area until it touches the needle stopper. Tighten the needle screw with the screwdriver. Slide the spool cap into the spool pin and return the spool pin to its original position. Pull the thread from the spool and pass it under the hook of the thread guide. Pass the thread behind the thread guide cover and to the front. Pass the thread through the guides as illustrated on the machine. Pass the thread behind the needle bar thread guide. Lower the presser foot lever to lower the presser foot. Pull the end of the thread, to the left and then pass the thread through the notch of the thread guide and then firmly pull the thread from the front and insert it into the slit of the thread guide disk marked “7” all the way. Cut the thread with the cutter on the left side of the machine. Lower the needle threader lever as much as possible to make the hook turn. Raise the needle threader lever slowly. Carefully pull the loop of thread through the eye of the needle to pull out the end of the thread. Pass the thread through the eye of the needle from front to back. Pass the end of the thread through the presser foot, and then pull out about 5cm of thread toward the rear of the machine. Used to sew parallel lines of the same stitch with two different threads of the same thickness and quality. Only use part code X59296-121 twin needle. Use with zigzag foot “J”. Attach stabilizer material if bunching occurs. Select the twin needle setting before sewing. Lift needle and presser foot to change sewing direction. With twin needle installed, thread upper thread for the left needle following instructions 1-9 for single needle. Manually thread the left needle. Insert the extra spool pin into the bobbin winder shaft and slide the thread spool on it, thread winding off from the front of the spool. Thread the upper thread for the right side of the needle as the left side was threaded. Without passing through the needle bar thread guide, manually thread the right needle. Check out sewing kit from the circulation desk. Install the presser foot holder. Attach the presser foot appropriate for the type of stitch (an icon for the presser foot to be used with each stitch appears at the top left of the LCD screen). Press the start stop button or foot control to begin sewing and again to stop. Use the reverse button to sew reinforcement stitches. Cut the thread using the thread cutting button. Raise the foot lever and remove the fabric. Remove all installed parts and return them to the sewing kit. Return the sewing kit to the circulation disk. Check out embroidery kit with embroidery thread from the circulation desk. Install the needle to match the fabric (75/11 generally, but 90/14 for denim or heavier fabric). Raise the needle to the highest position. Place bobbin with embroidery thread in place. Attach the hoop to the embroidery unit. Check and adjust the size and position of the embroidery as desired. Set the embroidery thread and thread the needle. After 5-6 stitches, stop the machine to cut the beginning of the stitch. Repeat steps 14 - 18 for each color as needed. "Finished sewing" will appear on the display when the last color is sewn. Ensure the needle is raised, raise the presser foot and remove the embroidery hoop. Remove all installed parts and return them to the embroidery kit. Reinstall the flat bed attachment. Return the embroidery kit with embroidery thread to the circulation desk. 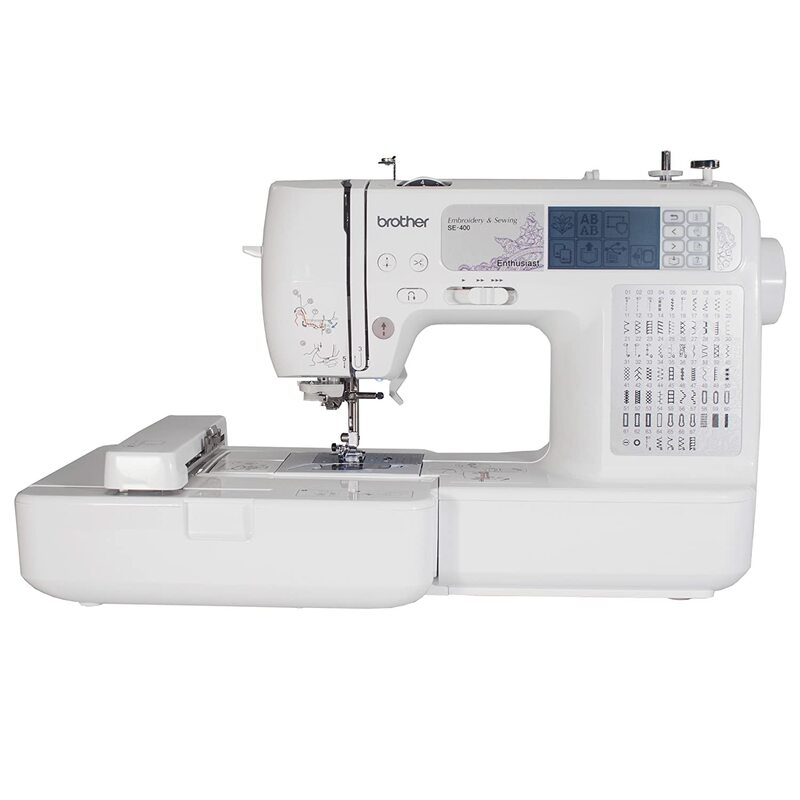 This document contains an overview, specifications, as well as basic and in-depth usage instructions for the Brother SE-400 Sewing and Embroidery Machine available for use in the library. Playlist of instructional videos direct from Brother. Turn off and unplug this machine when not in use. No food or drink near this machine. Do not use bent or damaged needles. Keep fingers away from moving parts. Ensure machine is off when making adjustments in the needle area. Use the spool cap that best fits your spool. Only use SA 156 specified bobbins. Use thread of No. 30 and higher. Use the proper foot for the designated stitch or function.